Definition at line 42 of file llfloaterlandholdings.h. Definition at line 84 of file llfloaterlandholdings.cpp. Definition at line 133 of file llfloaterlandholdings.cpp. Definition at line 251 of file llfloaterlandholdings.cpp. 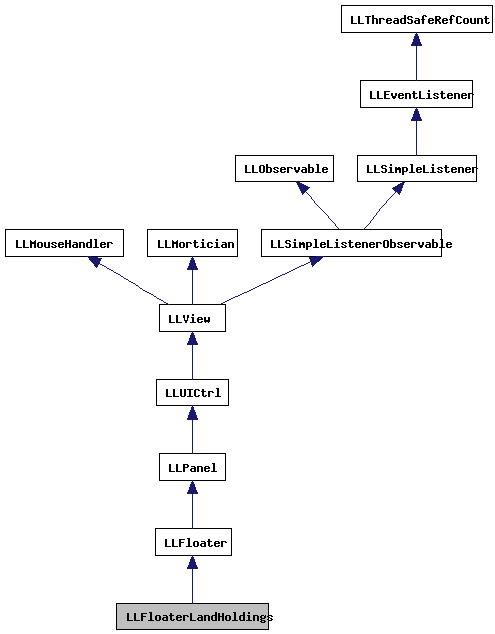 References gAgent, LLAgent::getPositionGlobal(), LLUICtrlFactory::getScrollListByName(), gFloaterWorldMap, list, LLVector3d::mdV, NULL, S32, LLFloaterWorldMap::show(), LLAgent::teleportViaLocation(), LLFloaterWorldMap::trackLocation(), TRUE, and VZ. Definition at line 139 of file llfloaterlandholdings.cpp. Definition at line 295 of file llfloaterlandholdings.cpp. Definition at line 286 of file llfloaterlandholdings.cpp. Definition at line 302 of file llfloaterlandholdings.cpp. References list, LLUUID::notNull(), and LLFloaterGroupInfo::showFromUUID(). Definition at line 96 of file llfloaterlandholdings.cpp. References ADD_SORTED, LLPanel::childGetListInterface(), LLPanel::childSetAction(), LLPanel::childSetDoubleClickCallback(), LLPanel::childSetUserData(), LLDynamicArray< Type, BlockSize >::count(), count, gAgent, LLDynamicArray< Type, BlockSize >::get(), LLPanel::getUIString(), i, list, llformat(), LLGroupData::mContribution, LLAgent::mGroups, LLGroupData::mID, LLGroupData::mName, onClickMap(), onClickTeleport(), onGrantList(), S32, LLUIString::setArg(), and TRUE. Definition at line 165 of file llfloaterlandholdings.cpp. References count, LLMessageSystem::getF32(), LLMessageSystem::getNumberOfBlocks(), LLMessageSystem::getS32(), LLMessageSystem::getString(), LLMessageSystem::getU8(), LLMessageSystem::getUUID(), i, list, llround(), MAX_STRING, LLCtrlSelectionInterface::OP_DELETE, REGION_WIDTH_UNITS, S32, sInstance, and TRUE. Definition at line 148 of file llfloaterlandholdings.cpp. References LLPanel::childGetSelectionInterface(), LLPanel::childSetEnabled(), FALSE, list, refreshAggregates(), and TRUE. Definition at line 314 of file llfloaterlandholdings.cpp. References LLPanel::childSetTextArg(), LLStatusBar::getSquareMetersCommitted(), LLStatusBar::getSquareMetersCredit(), LLStatusBar::getSquareMetersLeft(), gStatusBar, llformat(), and S32. Definition at line 59 of file llfloaterlandholdings.cpp. References LLUICtrlFactory::buildFloater(), LLParcel::C_ANY, LLFloater::center(), DFQ_AGENT_OWNED, gUICtrlFactory, LLFloaterLandHoldings(), LLUUID::null, LLFloater::open(), and send_places_query(). Definition at line 74 of file llfloaterlandholdings.h. Definition at line 75 of file llfloaterlandholdings.h. Definition at line 79 of file llfloaterlandholdings.h. Definition at line 82 of file llfloaterlandholdings.h. Definition at line 81 of file llfloaterlandholdings.h. Definition at line 71 of file llfloaterlandholdings.h. 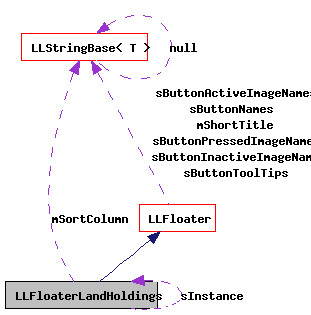 Referenced by LLFloaterLandHoldings(), processPlacesReply(), and ~LLFloaterLandHoldings().